Everyone’s favorite elderly rocker, GRANNY 4 BARREL, is fresh off the road with CKY and TEXAS HIPPIE COALITION, and is now set to go into the studio with producer David Bendeth (BREAKING BENJAMIN, PAPA ROACH, BRING ME THE HORIZON, BEARTOOTH, I PREVAIL) in early January - to lay down tracks for the shock rocker’s first-ever EP. (Granny decided to launch the campaign the day after Xmas so fans who were not sure what to do with the money grandma gave had a good place to use it!). 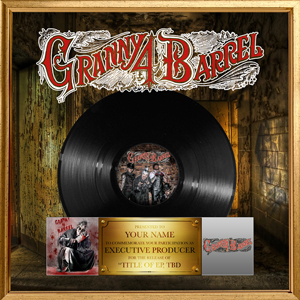 Fans will also have an opportunity to have their names included on the album artwork itself, and one super fan will have the opportunity to be the executive producer of the album, and share all the accolades that are bestowed on the album - like Grammy nominations and gold records (if either of those should happen). Granny also asks fans to show their support for her and the band, by sharing the PledgeMusic link to her campaign page. After all, who loves YOU more than your dear sweet Granny? !